Advocate Thuli Madonsela has achieved in her seven years as Public Protector what few accomplish in a lifetime; her legacy and contribution cannot be over-stated. In her final days in office she compiled the explosive State Capture report and, before that, the report on President Jacob Zuma’s Nkandla residence. Praised and vilified in equal measures, Madonsela has frequently found herself at centre stage in the increasingly fractious South African political scene. 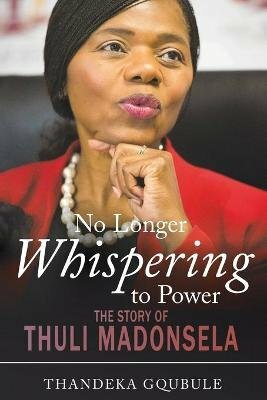 No Longer Whispering To Power is about Thuli Madonsela’s tenure as Public Protector, during which the whisper grew into a cry. It is the story of the South African people’s attempt to hold power to account through the Office of the Public Protector. More significantly, this important book stands as a record of the crucial work Madonsela has done, always acting without fear or favour. Still on chapter 2 and im enjoying the ride. Yeah!!! !